The adage “give a man a fish, you feed him for a day; teach a man to fish, you feed him for a lifetime” is at the heart of the difference between charity and philanthropy. Philanthropy derives from the Greek term Philanthropos, which means the “love of humanity” (Philos-love and Anthropos-humanity or mankind). While the roots of charity are often religious or moral in nature, philanthropy is based on broader humanitarian principles. Philanthropy broadly encompasses any altruistic activity intended to serve others, or the act of donating money, goods and services to support a socially beneficial or humanitarian cause, with no financial or material reward to the donor. More specifically, charity focuses on solving a current problem, or responding to an immediate need of an individual or a group, whereas philanthropy aims to effect change through giving. It encompasses any attempt to deal with the problems of society as a whole, by preventing the conditions that created those problems and addressing the root causes of individual or collective needs. Philanthropy often relates to expression of one’s values – be they religious, cultural or personal. Families in India are in some ways microcosmic socio-economic systems, strongly embedded in their local communities, and have a long tradition of giving to the poor, needy and destitute. Donating towards temple building, for instance, has been a favored charitable activity throughout history. Business families, for instance, do not focus only on achieving sustainable financial growth, but also on contributing a part of their income for social good. Traditionally, companies have directly given to charitable organisations or to individuals in need, or have undertaken activities for social good on their own. In recent years, their focus has shifted from charity to philanthropy and many new activities such as environmental conservation and preservation of history and art have become part of the philanthropic activities of business families and of corporate philanthropy. As the charitable impulses of family businesses slowly transformed into sustainable organized philanthropic initiatives, companies started setting up Corporate Social Responsibility (CSR) wings. As businesses grew and professionalised, several family businesses institutionalised their philanthropic activities in the form of family foundations. These served as excellent forums for family collaboration and a means of transferring the mantle of philanthropic stewardship to succeeding generations. Gradually, the global business environment and stakeholders’ growing expectations encouraged businesses to pay close attention not only to their philanthropic activities, but also to the measurable social impact of these activities. Today, companies view their philanthropic programmes not only as corporate or family resources meant for social development, but also as strategic social investments intended to achieve measurable outcomes and impacts. Corporate philanthropy programmes are often a part of the organisation’s mission and are designed to address social and political issues that affect the business. During the early days of industrialisation in India, philanthropy was limited to individual initiatives undertaken by organisations and rich families. During the independence movement, several industrial thought leaders extended their financial support to leaders of the freedom struggle. G.D. Birla’s financial contributions to the movement and Ardeshir Godrej’s generous donation to the Tilak Fund for the upliftment of Harijans were notable among these. The Tatas and the Murugappas pioneered charitable contributions to hospitals and schools. Currently, on average, Tata Sons contributes between 8 to 14 percent of its net profit every year for philanthropic activities through the various Tata Trusts. Since philanthropy was considered as pure service to mankind and thus to God, women of many such prominent families were encouraged to get involved. Non-working family members, primarily women, took an active part in key decisions in philanthropic activities. While key members of the family drove economic wealth creation, others took care of the trusteeship role expected from the family by taking up various philanthropic initiatives to improve the lot of the underprivileged. In the paradigm of Indian philosophy, service to mankind is believed to bring God’s blessings, and hence the business family chose to directly supervise its philanthropic activities. Support came from the business organisation through executives and assistants who shared these sentiments. In essence, service was the only motto of philanthropy in the early days, and everyone who wanted to get involved, regardless of his or her technical or managerial capabilities, was encouraged. The quality of work was measured in terms of input flow, particularly amount spent, rather than the net outcome. While effectiveness was important, efficiency was assumed. 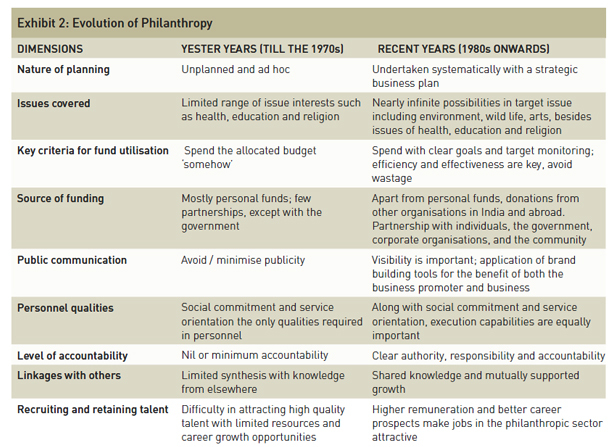 A quick glance at the current Indian philanthropic scenario would show a number of interesting trends. Broadly, one can see the emergence of three models of philanthropy. Corporate Social Responsibility (CSR) is the most prevalent form of philanthropy worldwide, though the levels of activity and organisational involvement vary widely. Most large organisations have a social responsibility arm, with budgeted resources and dedicated staff, which works towards improving the quality of life of the workforce and their families, as well as for the local community at large. Most philanthropic initiatives are undertaken in the business neighborhood, mainly because of the immediate impact on local stakeholders. Organisations with multiple locations tend to undertake community building activities in as many business locations as possible. Such ‘pure’ corporate initiatives do not have much participation from the business promoter’s families. This is particularly the case if the promoter family is not very closely involved in the business. With the transformation of the economy in the 1990s, a new generation of corporate leaders, such as those of Infosys and Wipro, have shown tremendous interest in investing their wealth for social development. They have demonstrated how several strategic approaches used by professional organisations can be applied for formulating policies and programmes for inclusive growth. Several such individuals and their families have set up their own private foundations for philanthropy. Most are either first or second generation entrepreneurs such as Azim Premji or multi-generational family businesses. 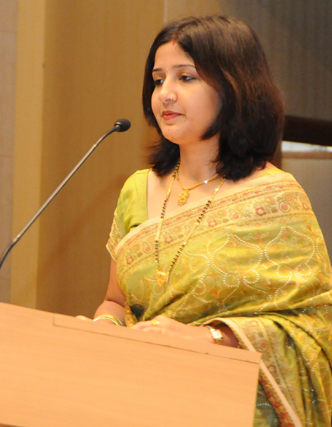 What we call family-corporate jugalbandi is the most common model of philanthropy in India. Since most Indian business organisations are family businesses, a separate philanthropic organisation is created, in the form of a foundation or trust. This is largely funded by the business, but often run under the leadership of the business family. One such example is the Krishi Gram Vikas Kendra (KGVK), an NGO set up by Usha Martin Limited, which receives a fixed annual grant from the company. GMR Varalakshmi Foundation, GMR group’s family foundation, is another example of family-corporate jugalbandi where the family business contributes a fixed percentage of its surplus to the foundation annually. In all these cases, family members take an active part in deciding the range of philanthropic activities and in overall programme review. However, they recruit high quality non-family professionals to develop structure, systems and processes for successful execution of these philanthropic programmes. These organisations tend to get into partnerships with other like-minded organisations – whether local, national or foreign – for aid and sharing of expertise. The major benefits of such a model include higher accountability, knowledge sharing, talent acquisition, an ability to scale up programmes quickly, and system and process optimality brought in by external funding. Philanthropy is no longer understood as simple charity. Current philanthropic initiatives are in alignment with current social realities and aim to attack social problems at their root. Contemporary business philanthropy strives to create awareness about environmental issues such as afforestation, water harvesting, global warming; about issues like foeticide, discrimination against girl child, and about the spread of diseases like HIV-AIDS. This metamorphosis has been in tandem with changes in the economy in recent years, as economic development has picked up momentum with liberalization and progressive economic policies. As shown in Exhibit 2, the change has been for the better in all respects. In recent years, philanthropy has become both efficiency and effectiveness- oriented, thanks to larger corpuses of funds, more strategic planning, a more professional approach and more rigorous outcome/impact measurement of the amounts spent on philanthropy. 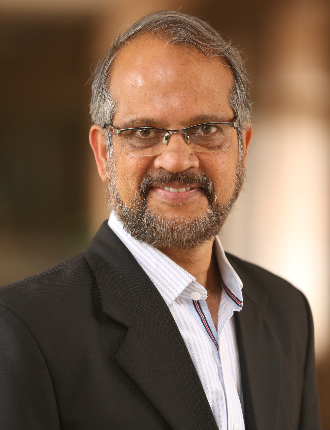 Indian philanthropy has emerged in recent years as a mainstream professional activity, thanks to rapid economic growth, and the globalisation of knowledge and funding resources. Organisational leadership now insists on the best use of their resources for inclusive growth. Family businesses are fast opting for an entrepreneurial approach to problem-solving, both in terms of identifying new areas of activity and improving existing ones. Philanthropy now aims at capacity-building of the target group. The professional approach to solving complicated issues, the use of metrics, and strategic decision-making has transformed philanthropy from mere monetary giving to targeted goal-oriented support to worthy causes. Also, as the breadth of activities and range of possible ways of contributing to any specific cause have expanded, immense possibilities have opened up for volunteers and donors. In the post-globalisation landscape, individual entrepreneurs and business families have increasingly accepted a tri-fold bottomline of growth that includes community and environment. What is noteworthy is that the fundamental premise of philanthropy – its motto of service – continues as before. Though philanthropy is still at a nascent stage in India, there are clear signals of the potential contribution it can make to building a better planet for this generation and beyond. With further refinements in strategy, processes and resource allocation, we can expect better synthesis and synergy in the meaning and relevance of trusteeship, conveyed through the organised and strategic philanthropic initiatives of businesses and their families.